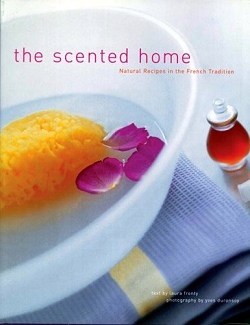 How fortunate we are to have found a small stash of Laura Fronty's wonderful book on scent. We have been looking for a book like this for some time. Unfortunately, a lot of the really wonderful herb books are being discontinued. The photos in this book are top notch as the book itself is. Her first chapter is on scents from plants. After a little history and some old world recipes, Ms. Fronty dives right into some do-it-yourself potpourri recipes, like her green mix full of your own home grown herbs. These are followed by simple yet elegant fragrant bouquets, and table decorations. The second chapter incense and essences suitable for perfuming the air. Remember this is a book in the French tradition so there are delightful detours into things like incense papers and simple to create fruit candles. The next chapter takes to our beauty routine. Make your own violet water. read about the history of Eau de Cologne, and create an English-style perfumed vinegar. Several body oil an soap recipes are also included. And, let us not ignore the laundry. The wonderful narrative continues telling us that a very famous king required his washerwomen to wear underwear scented of soap powder made from cloves and nutmeg. This section is where you will find wonderful sachets like the one from the South of France full of lavender and rosemary and other Meditteranean goodies. And, don't miss the exotic scented water recipe for pillows with mandarin and jasmine essence. Who wouldn't sleep better? Lastly, we even have food. Her statement that good-quality herbs are a must in French cooking pretty much says it all. Perfume your jelly with scented geraniums or make a cake with green tea. History and a few pertinent recipes fill you with ideas. A glossary and shopping guide come in at the end. This is a very beautiful book full of history and fun references. It has already become a classic. Additional books you might like on gardening with scented plants!